For many people with neuromuscular disease, there comes a point when walking becomes too difficult, and it’s time to start thinking about power mobility aids. This typically boils down to choosing between a mobility scooter and a power wheelchair. Given the progressive nature of neuromuscular disease — not to mention the financial investment involved with purchasing a power mobility aid — it’s important not only to select something that will meet your functional needs now and in the future but also to advocate for features that will provide you with the best long-term quality of life. Mobility scooters are designed primarily for outdoor use and are steered with handlebars. Power wheelchairs, on the other hand, are designed for indoor and outdoor use, are highly customizable and maneuverable, and are steered with a joystick or an alternative input control, such as a switch or head array. If you are considering making the move to power mobility, a good first step is to contact your insurance provider and ask what types of power mobility aids are covered by your policy, how much the insurance company will pay for a power mobility aid and how often they will pay for a new one. Most insurance companies cover mobility aids once every five years; however, there are exceptions. Knowing your insurance provider’s coverage may help you make your choice. For example, for someone with a fast-progressing neuromuscular disease, there may be only a short window of time during which a mobility scooter can be used, and insurance may not pay for a power wheelchair less than five years after paying for a scooter. 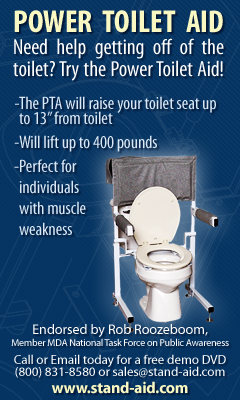 In this case, a power wheelchair may be a more practical choice. Your MDA Care Center physician will typically provide you with a referral to get a formal mobility evaluation and seating assessment. “Evaluations are typically led by the primary therapist,” says Angie Kiger, MEd, CTRS, ATP/SMS, clinical strategy and education manager at Sunrise Medical in Alexandria, Va.
Kiger advocates for an interdisciplinary approach, where your MDA Care Center physical therapist (PT) or occupational therapist (OT) works in coordination with a complex rehabilitation technology (CRT) supplier who is credentialed as an assistive technology professional (ATP). ATPs are trained in analyzing the needs of people with disabilities, assisting in the selection of appropriate assistive technology and providing training in the use of the selected devices. During the interview, the mobility team will ask questions about your neuromuscular disease, your preferences and goals, how your mobility changes as the day progresses, and what your mobility looks and feels like on your best and worst days. After the interview, the team will conduct a physical evaluation. During the evaluation, the PT or OT and the CRT supplier will take measurements and assess your functional mobility. Mobility scooter cushions do not provide a lot of support for the back and neck, so if you need additional support to maintain a healthy posture throughout the day, a power wheelchair with a customized seating system may be more appropriate. When a family chooses a power wheelchair, Kiger moves on to what she calls a feature match. During this process, specific features are selected based on individual needs. For example, if the client has a form of neuromuscular disease that impacts hand function and fine motor skills, alternative control mechanisms can be designed. For those who are not able to shift their body weight, power seating allows the user to tilt the chair for pressure relief. A headrest is beneficial for those who cannot hold their head in a proper position, and lateral supports can help maintain proper leg positioning. Vovanti Jones, a 30-year-old physician living with limb-girdle muscular dystrophy (LGMD), uses a mobility scooter and a power wheelchair interchangeably. She prefers using her scooter for work because it’s more compact and easier to maneuver. However, her power wheelchair is more comfortable for spending long periods of time seated. Jones’ power wheelchair seat has an elevate function, which raises her seat so that she can reach items on shelves. There are a number of practical considerations that help inform the decision-making process, including lifestyle, living environment, transportation issues and finances. 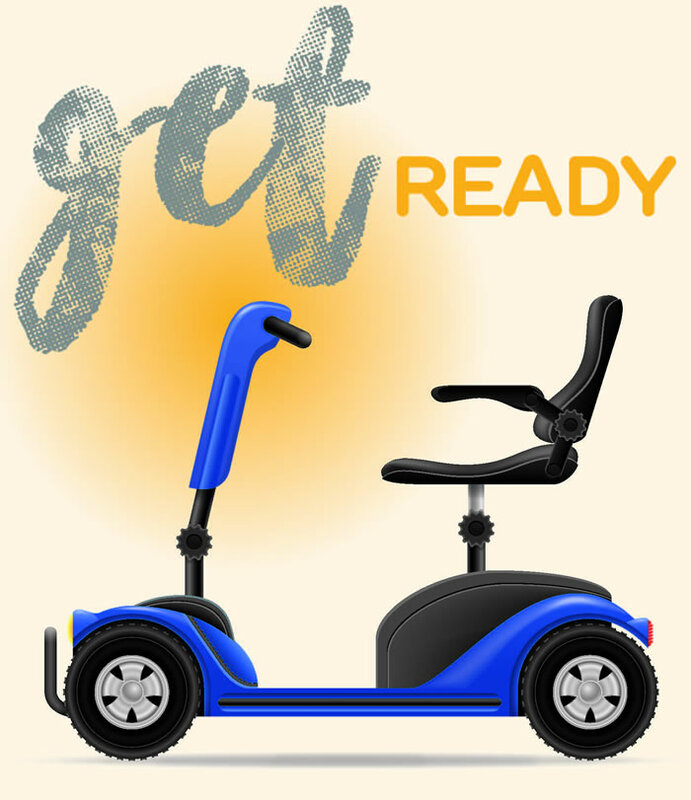 From an environmental standpoint, you, your caregiver and your mobility team will look at whether the power mobility aid will be used primarily in a home or work environment, indoors or outdoors, and whether the surfaces it will roll on are primarily finished, paved or rugged. If the mobility aid will need to be transported to and from various locations, the team may also ask if you are able to afford an accessible vehicle. “A full-blown power wheelchair can be difficult to transport if the user does not have the proper equipment,” Kiger says, “so if the family is looking to transport the wheelchair, they have to think about a wheelchair-accessible van. They also have to think about things like accessible housing and ramps. If those things are financially out of reach, we might recommend funding programs or resources to assist with getting the proper equipment. Ease of transportation is sometimes what draws individuals toward a mobility scooter. Some can be folded up, making them really convenient for travel. Your mobility team will present all types of mobility aids and features that are clinically indicated. Depending on your situation, financial considerations may have a significant impact on the type of mobility aid you ultimately select. The process of getting a power mobility aid can be overwhelming, particularly for those who are newly diagnosed or are getting their first piece of equipment. Working with qualified professionals can help to ensure you get mobility equipment that will meet you or your child’s individual needs. Keep in mind that you may need to advocate for features that provide you with the best quality of life and be prepared to fight for them if necessary. If your health insurer does not provide authorization for coverage, you can ask the provider to reconsider its decision. You also have the right to appeal the decision and have it reviewed by a third party. “No” isn’t always a final answer. When it comes to paying for power mobility equipment, it can be difficult to figure out what options are available beyond insurance. We asked Gina Olson, national director of the MDA Resource Center, about alternative funding sources. Q: Do insurance providers offer financial assistance outside of what is covered in the policy? Some insurance companies have foundations or grants that can help with co-pays. It’s important to ask about these programs before purchasing mobility equipment because many won’t retroactively pay for equipment. Q: Where else can I look for help to pay for mobility equipment? Some foundations and grant programs help pay for medical equipment. You may have access to state and county waiver programs. If you are currently employed or a student, state or local vocational rehabilitation services may be able to help. Some hospitals offer financial assistance programs. Q: Which resources are available to me? There’s no one answer to this question because resources vary by location and individual information. The MDA Resource Center (833-ASK-MDA1 or resourcecenter@mdausa.org) can help identify funding organizations and programs in your area and find out if there are qualifications you must meet to apply.